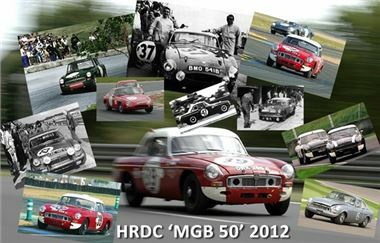 The much talked-about HRDC MGB50 Series got underway at Goodwood on 1 November, with an auspicious reunion between four original works MGB competition cars and some of the luminary figures who were instrumental in the success of these fabulous racers. The Works MGB cars were not just on static display, but were put through their paces on the Goodwood circuit by Barry Sidery-Smith, Tony Dron and Paul Campfield, to the amazement of the many MG aficionados present, who all agreed that this was probably the first time that the four works cars had ever run together. The HRDC MGB50 Series will consist of six rounds, each a 30-minute, single-driver race for pre-'66, FIA-specification MGB race cars, with an invitation class for historically important MGBs which do not comply to FIA Appendix 'K'. The first round of the series takes place at Castle Combe on 9 April 2012.